America's 21st Century energy revolution began at home with a sweeping technological advancement known as 'Hydraulic Fracturing' or 'Fracking'. 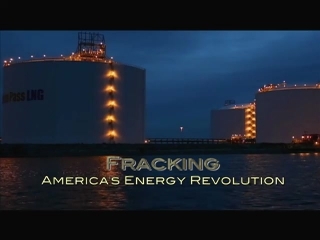 This enlightening series, Fracking: America's Energy Revolution, examines the science and economics of this latest boom in America's oil industry. Program One, The Science examines hydraulic fracturing, or fracking, and how this extraordinary science and technology of recovering energy from oil shale has sparked a 21st century energy revolution in the United States. 00:03:03The technology developed for obtaining gas and oil directly from what are known as black shales, tight shales and organic-rich shales, turned out to be a combination of advances in hydraulic fracturing coupled with advances in horizontal drilling, known simply as fracking. 00:13:14The father of the fracking revolution is George Mitchell, who started the search for unconventional oil and gas in Texas's Barnett shale; but it is the use of horizontal drilling coupled with multi-stage fracturing and the use of specialized proppants to fracture the shale that made the new industry economically feasible. Program Two looks at the economics of hydraulic fracturing or fracking and its impact not only on America's oil industry and energy based economy but on the 21st century's, global energy geopolitics. 00:06:02The new sources of gas and oil found through fracking has spurred American job growth and some say it is responsible for pulling the U.S. out of the Great Recession of 2008. 00:03:18Every energy revolution has adverse impacts to the environment and fracking has problems too, including leaks and spills that can cause ground and surface water contamination, methane gas releases, increased CO2 emissions effecting climate change, and the possible contamination of aquifers by the additives in the chemical solutions used for creating the hydraulic fracturing. 00:06:17Following the 1970s oil crisis and OPEC oil embargo, the American Congress placed a ban on the export of American crude oil; however with the 21st century shale revolution America's energy independence has changed her role in energy geopolitics, specifically in global gas and oil geopolitics, while at home big oil and big oil companies are taking a backseat to smaller oil companies and entrepreneurs leading the energy revolution of the 21st century.